Firing up the WWE Network and giving this one a watch. Here’s a review of WWE Hell in a Cell 2011. Before the opening match R-Truth and The Miz, both having been fired by Triple H, are seen making their way to ringside seats. 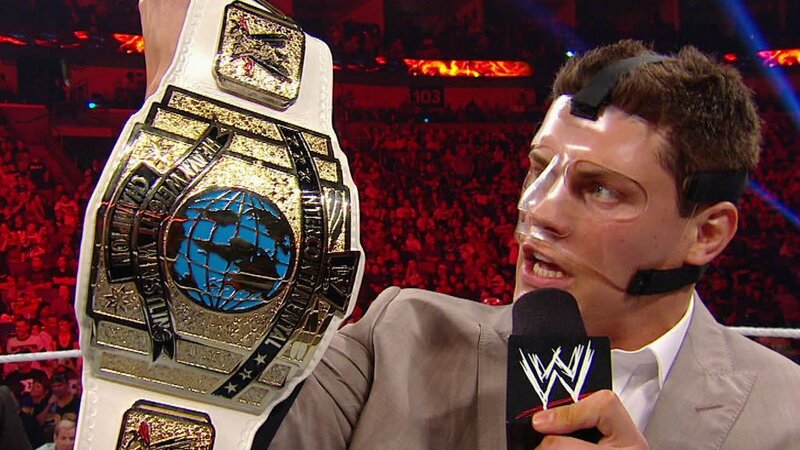 John Laurinaitis comes down with security in tow and gives Truth and Miz the boot. This was a very fun, solid opening match. Sheamus’ strength has always been in brawler style matches. One would not expect Christian, the smaller of the two, of being able to stand, strike, and brawl with Sheamus but he does a good job of holding his own and even being dominant at one point in the match. There was a moment on the outside where Christian is able to hit Sheamus with a Spear. Sheamus just barely makes it back into the ring before the count of ten and Christian immediately hits Sheamus with another Spear. I thought this was a pivotal moment in the match because the near fall got the quiet crowd into the match. Finish comes with Christian fighting out of the Celtic Cross Powerbomb (a move Sheamus should reimplement in his repertoire), he attempts another Spear but this time Sheamus side steps Christian and he goes crashing into the post. Off the rebound Sheamus hits Christian with a Brogue Kick and gets the win. Backstage Matt Striker interviews World Heavyweight Champion Mark Henry who punks Striker out. Henry says it doesn’t matter what setting, Randy Orton is going into the Hall of Pain. Man this could have been really cool if it was given the right attention. Oh no, Sin Cara mood lighting. The match was going along just fine when one of the strangest sequences I have ever seen took place on my TV screen. Sin Cara Blue hits a topè, goes back into the ring and exits once again via baseball slide. Sin Cara Black is now laid out VERTICALLY head pointed to the ring. Sin Cara Blue decides now would be a good time to break out an Asai Moonsault to the floor. He not only overshoots this absolute pointless spot, he lands stomach flat on the outside. Sin Cara Black had the smarts to raise his boot but still, why? Just why? The finish comes with Sin Cara Blue countering a Powerbomb into a Yoshi Tonic/Code Red for the win. David Otunga interrupts CM Punk while he is getting ready for his match to offer his legal services. Punk hates lawyers. He tells Otunga to scram! Surprisingly Orton is dominant in the early goings in this match. There was a cool spot in the middle of the match where Henry launches steel steps at Orton who thankfully got out of the way in time. This match was a fantastic showcase of the monster heel type run Mark Henry had that brought him the title. The cage and ring posts were often used as a weapon. Orton had a very nice comeback which included him using the cage like Spider-Man to escape a World’s Strongest Slam. Orton hits Henry with an RKO but Henry kicks out at two! A shocked Orton knows there is only one thing left to do, time to punt Henry’s head off. Orton does that thing where he stares off into space and we believe he hears voices in his head. This would prove to be his downfall. As Orton is poised to strike Henry leaps up and catches Orton, driving into the mat with a World’s Strongest Slam. Henry gets the three count and retains the World Heavyweight Championship. After the match Henry hits Orton with another World’s Strongest Slam. He exits the ring and returns with a steel chair. He vowed to end the career of Randy Orton tonight and he is looking to do so by breaking his ankle. Henry looks to smash the ankle the same way he did Kane and The Great Khali. Just before impact Orton moves his leg out of the way and Henry goes crashing into the mat. Orton takes advantage and begins beating Henry with the chair. Henry goes to retreat but Orton chases him down and continues to pummel Henry with the chair as he retreats to the back. Orton has this deranged blank look on his face. My issue with this is your fresh monster heel champion who just won his first major title defense in his fifteen year career, is back pedaling like a chump! C’mon man. Backstage Josh Matthews gets a word from Alberto Del Rio who says he’s not some animal you can just lock up in a cage. However he promises that tonight, John Cena and CM Punk will see a side of Alberto Del Rio they’ve never seen before. The Intercontinental Champion Cody Rhodes makes his way down to the ring flanked by his “baggers”. Rhodes says if anyone denies wearing a bag they should be figuratively euthanized. Ouch. Rhodes dumps the IC Title belt in a brown paper bag and re-introduces the classic Ivory White Intercontinental Championship belt. He vows to wear it with more pride than the greats before him. He is interrupted by John Laurinaitis who says he was sent out there to inform Cody he will be defending his title right now against…John Morrison! Looks like Cody is going to have to wrestle this one wearing Gucci shoes and a silk shirt as pointed out by the irate Michael Cole on commentary. Pretty standard contest. Rhodes at one point holds on to the ring post on the outside either in protest or just to get himself counted out which obviously does not work. Morrison attempts a Springboard Spin Kick but misses which allows Cody to roll Morrison up for the win. Backstage in Triple H’s office he is interrupted by Laurinaitis (seems to be his thing). Triple H tells the Executive Vice President of Talent Relations that he has no authority (no pun intended) to make matches, they must come from Triple H and only Triple H. Laurinaitis informs Hunter that they have bigger problems at the moment. Miz and R-Truth are in the locker room beating down talent. The two rush to the locker room as Miz and R-Truth are being forcibly removed from the scene. Triple H informs Laurinaitis that it is his duty to uphold the safety of talent, something he has failed to do. One more incident like this and it could mean curtains for Laurinaitis. This match was 90% Phoenix and 10% Kelly Kelly. The current Divas Division would be even better if Beth Phoenix was around. Lets face it, Kelly Kelly wasn’t the best in the ring. Part of being a good performer is doing your best to hide your opponent’s weaknesses and accentuating your/their strengths. Phoenix does just this by dominating most of the match with power based maneuvers. This in turn makes Kelly, who is the weaker of the two, have to work from underneath as the underdog. The finish comes with Natalya mocking Kelly on the mic from the outside while Phoenix has her in a submission hold. Kelly gets to the ropes forcing a break and while the official is reprimanding Phoenix with his back turned to Kelly, Natalya lays in a shot with the microphone. Phoenix seizes the opportunity and hits the Glam Slam for the win. Overall I thought Hell in a Cell 2011 was a decent show but nothing out of this world. However both Hell in a Cell matches were absolutely phenomenal and both had something different than the other to offer. Watch the two gimmick matches if you’re bored one day. You can also submit your own Retro Review! For more details email us here. Make sure to write in the subject line “Retro Review” and what event you are reviewing. HobosGhost’s Scavenger Hunt – Kasai, Shirai…Oh my!